To understand diseases like Parkinson’s, the tiniest of puzzles may hold big answers. That’s why a team including scientists from the National Institute of Standards and Technology (NIST) have determined* how two potentially key pieces of the Parkinson’s puzzle fit together, in an effort to reveal how the still poorly understood illness develops and affects its victims. This puzzle is a tough one because its pieces are not only microscopic but three-dimensional, and can even change shape. The pieces are protein molecules whose lengthy names are abbreviated as GCase and α-syn. The two proteins wrap around each other and take on a complicated shape before attaching themselves to the membrane surface inside a neural cell in a victim’s brain. 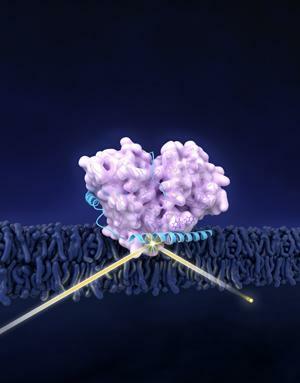 To get a better handle on how these proteins operate in the body, the team—which also included scientists from the National Institutes of Health (NIH) and Carnegie Mellon University—came to the NIST Center for Neutron Research (NCNR) to get a picture of how the two proteins combine into a single unit called a complex that interacts with cell membranes. Using techniques including neutron reflectometry, the team teased out the first-ever structural picture of the GCase/α-syn complex, including their shape change. This work was published in Journal of Biological Chemistry.